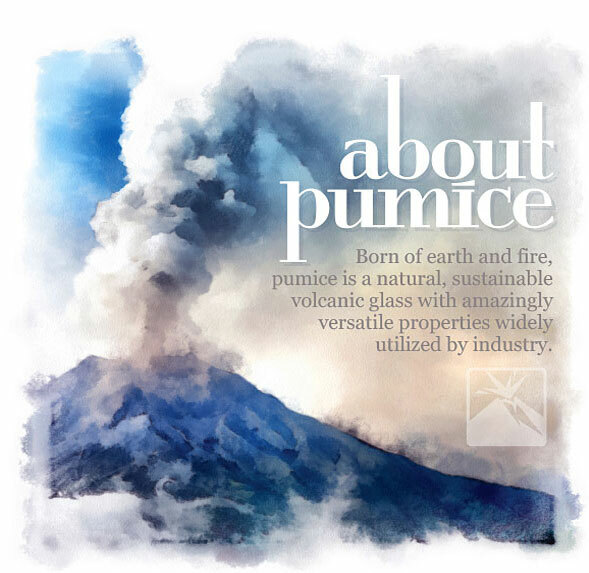 Born of Earth and Fire, Pumice is a Natural, Sustainable Volcanic Glass with Amazingly Versatile Properties Widely Utilized by Industry. PUMICE IS BORN in pyroclasic events, typically spewed as ash that falls and drifts into deposits or as part of a massive pyroclastic flow. Many factors affect the useful quality, color, and purity of a pumice deposit, but on a chemical analysis level, pumice is basically an aluminum silicate. With no crystalline structure, pumice is a naturally calcined amorphous glass made up of a maze of air-filled vesicles. Pumice made its mark in history as being of value to industry when Roman engineers combined pumice aggregate and fine-grained pumice (a pozzolan) with their hydrated lime cement to make a lightweight, enduring concrete. Today, pumice is still being used as a superior pozzolan to super-charge concrete, but is also used widely in a variety of industrial process and product applications. Pumice enjoys a well-deserved green credibility, as it is an abundant and sustainable resource, easily mined from surface deposits, and by virtue of being naturally calcined in the fiery heat of a volcano, the only refining needed is to crush and screen it to grade.